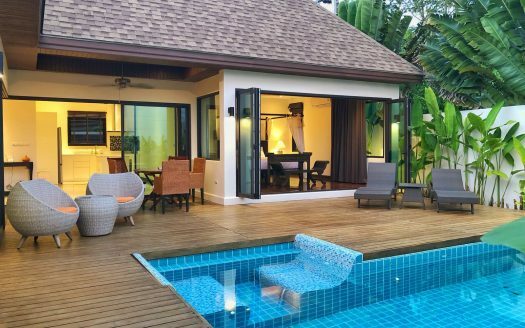 Located only 5 minutes away from the beautiful white sandy beach of Nai Harn, this spacious luxury 600 square meter Thai villa is built on 2000 square meters of impeccably well maintained gardens and in addition has access to its very own private lake and small island which are built on one hectare of land, exclusively reserved for the villa. In detail, the garden area is comprised of tropical plants and flowers to admire, shaded trees and jungle type forests to lounge beneath, coconut, banana and palm trees which remind of exotic flavors. The meadow type lake is stocked with wild fish. A small boat and fishing gear are complimentary for those wishing to catch their own game to be prepared by the private chef (or cook by oneself) to enjoy in the dedicated BBQ dining area. Not limited to fishing only, the boat may serve as a romantic vessel to float away into dreamy picturesque setting. Rich tropical views of the lush surrounding green mountains and multicolored sunset skies are only but some of the eye candy to relinquish and savor. The villa conveniently provides quick access to a lovely charming street market with delicious restaurants, friendly bars and pubs, quality massage parlors with spa options, convenient recreational centers and various shops. The villa includes 6 spacious bedroom suites; the master bedroom is more independent with access to the swimming pool and garden, and composed of a king size bed with en suite lounge and private 25 square meter balcony overlooking coconut trees. All suites -have the privilege of their very own marble bathroom, shower and en suite bathroom. Each bedroom is configured with a teak wood king size bed, high quality comfort mattress to guarantee the best night’s sleep and it is feasible to install an additional bed per room upon request. The architecture of the common living area of the house which in Thailand we call “The Sala”: living room, dining room and marble bar, provides maximum freedom of space due to the presence of columns rather than conventional walls, thus enabling natural air ventilation and no need for air conditioning. Most of the furniture is made of teak, the highest grade of wood, with a sweet rich smell, that Integrates perfectly with traditional Thai design. The fully equipped marble kitchen has direct access to the lounge / Sala. It offers exceptional relaxation activities; a massage area located just beyond the swimming pool, an air hockey table, ping pong table, deluxe Pool table, private boat and lake, 2 fishing rods, inflatable sun beds to float upon the wide lagoon shaped swimming pool and much more. • Bedroom 1: King size bed Master bedroom 50m2 with 20m2 balcony, Very high quality mattress. Marble floor. • Bedroom 2: King size bed Independent bedroom with direct access to the pool area, High quality mattress, wood floor. • Bedroom 6: King size bed, High quality mattress, marble floor.